Following on from the update to its mobile applications Evernote has today unveiled their newly revamped web app which has been redesigned with a new three panel interface, and has been designed to function in browser on either your tablet, computer or mobile device if required. 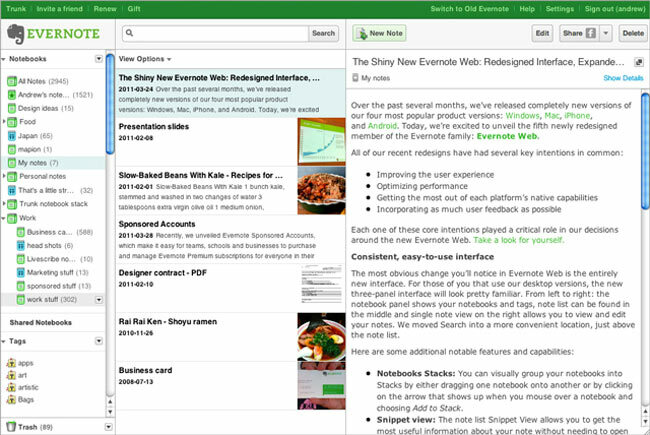 Other tweaks within the new Evernote web app include performance improvements together with a share button for easily firing off notes to others via the major social networking sites or email. An auto save feature has also been included in the new web app, which works in a similar way to Google Docs that automatically saves as you write. Other useful features of the new revamp include the ability to stack your notebooks for easier organisation and reference. A snippet view which provides more detail about a note without the need to open it fully. Together with saved searches which allows you to perform any searches that you’ve saved using a desktop version of Evernote by clicking into the Search bar. More details are available on the Evernote blog site.